You can find extensive background information on the exhibition in our archive, including interesting topical facts, in-depth information, illuminating insights, and interviews with renowned scientists. Here you’ll find reviews, events and articles about our exhibition. We’ve selected some press clippings for you. Mashable describes The Discovery of King Tut as “the greatest ‘unboxing’ of the twentieth century.” Travel back in time with a slide show of historic excavation photos, colorized for the very first time for this exhibition. To celebrate New York’s love of the golden boy, we decided to publish The Tut Times, a special newspaper, free for all visitors to The Discovery of King Tut at Premier Exhibitions 5th Ave. 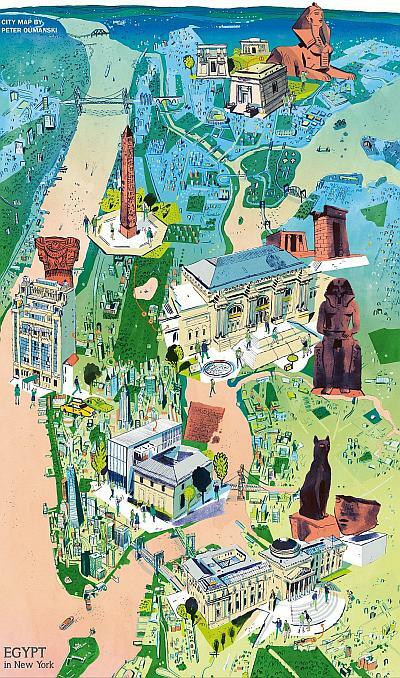 Within, David Kamp, a long-time contributor to Vanity Fair magazine, wrote a series of articles about New York’s relationship with Tutankhamun, and illustrator Peter Oumanski created a special city map, highlighting Egypt-themed locations. For a taste of The Tut Times, you find here David Kamp’s article “NYC Loves Tut” and Peter Oumanski’s New York map. “Ever since I was a child I have wanted to go back in time. I couldn’t build a time-machine, but I found some old photographs had a curious effect on me. While most old pictures look like ‘the past’, some look like ‘now’ – but a different version of ‘now’. When I saw such pictures, I felt as though the barrier between past and present had been dissolved – the closest experience I had had to time-travel.” These thoughts led Chris Wild to found the website Retronaut, now licensed to Mashable.